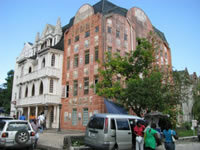 St George's Village in Port Antonio, is a shopping Mall with a difference. Intriguingly and tastefully designed in the style of a medieval castle, it will have you looking around for knights in shining armour instead of shopping bargains. The threestory Village of St. George was built to resemble an eclectic European village. It contains boutique shops, restaurants and cafes. The corner of West and Harbour streets, Port Antonio. Shopping complex boasting several upscale shops selling jewelry and crafts. All our Charter Services Operators vehicles are fully air-conditioned 4-7 seater Taxi, 15-30 seater buses and coaches. Luxury Limousine service is also available. All Taxi and Tour drivers are fully trained, licensed and approved by the Jamaica Tourist Board. We offer a 24 hour, seven day a week, private taxi and tour charter service. We go that "Extra Mile" to ensure that you have a rich and enjoyable experience.